This my friends is a total cheat dessert. Sometimes in the middle of the day, I get cravings. Yes, you read that right. This dessert is all about the frosting. The cake is just a slightly doctored up Duncan Hines Fudge Cake Mix. Then it’s topped with a fluffy vanilla buttercream frosting. And sprinkled with Candy corn m&m’s. Yes. I think they really do taste like candy corn. But I know many of you won’t be able to find them. So throw on the real stuff and that would be cute too! It tastes so good with the buttercream frosting. Best part? You bake it in a 15×10 baking sheet…that makes a lot of cake bars! Just sayin. And if you put these in an air tight container, the frosting keeps the cake moist for up to a week! Maybe longer…but I wasn’t able to test that theory. Ours lasted 5.02 days. The .02 is that is about how long it took me to eat the last cake bar after waking up and pouring my coffee. 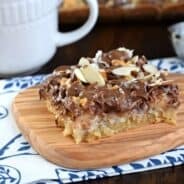 Like this cake bar recipe? You may also enjoy these bar recipes…. 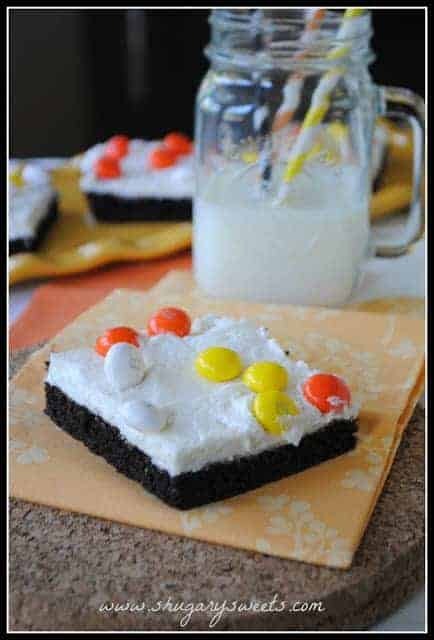 Chocolate Chip m&m Cookie Bars with Rainbow Frosting– delicious chocolate chip cookie base topped with buttercream frosting. Oh, and the frosting has an awesome rainbow swirl!!! Gooey Chocolate Brownie Bars– instead of gooey cake bars, I took a chocolate cake mix and make gooey brownie bars. No frosting needed on these! Cinnamon Frosted Zucchini Bars– garden zucchini is the highlight of these soft and sweet bars. Top them with a sweet cinnamon frosting and these are perfect for breakfast or dessert! In mixer, beat cake mix with eggs, water and melted butter. Spread into a greased 15 1/2x10x1 baking sheet. Bake in a 350 degree oven for 15-18 minutes. Remove and cool completely. In mixer, beat butter for 2-3 minutes, until fluffy. Add in powdered sugar, cream and vanilla. Beat until fluffy, about 5 minutes. 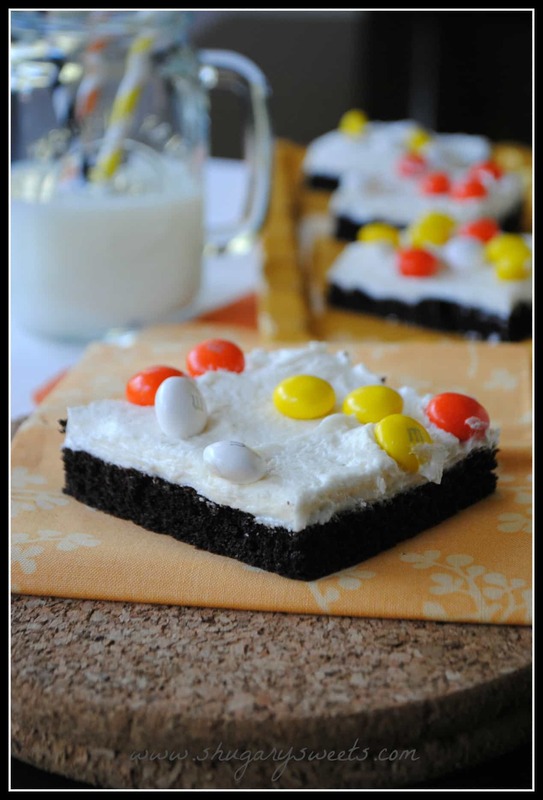 Spread over cooled cake and sprinkle with candy corn m&ms. Cut unto squares and enjoy! How delicious!! I think I share your icing cravings, too. haha. 🙂 I like the contrast of chocolate and vanilla so I would love these treats. Candy corn over the top would be adorable for October! Mmm yummy! The cake mix looks so fudgy as you said, and love that you added a contrasting layer of the vanilla buttercream. The candy corn M&Ms look fantastic too. We don’t get them here but they sound equally delicious. Feel free to just use regular candy corn. It will taste very close, and still look cute! Where’s the candy corn??? Jk. I mean, I’ve eaten an entire bag of those white chocolate m&ms in the last week (who hasn’t? ), but I’ve also eaten 2 (maybe 3) bags of candy corn by myself in the last week. So. I get extra excited when the see “candy corn” in the title of anything. I made candy corn blondies last year and candy corn is tricky too bake with! It takes on the character of caramel and oozes and sticks. You and me both! Love candy corn! I have baked with it too…doesn’t look pretty, that’s for sure! I have days where I crave frosting too:-) Whenever I have a cake order, I save the extra frosting and refrigerate it for those days! 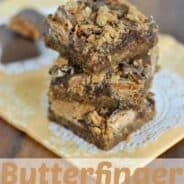 I love how chocolatey and fudgey your bars are! Plus the black and white with the fun m&m’s is the perfect Halloween treat!!! I loooooove this cake. That frosting…I’d eat it without the cake!!! You eat my kind of breakfast. Sometimes I cheat with cake mix too Aimee! 🙂 I have yet to try those candy corn M&Ms!! My sister both texted me the same day telling me I must buy them. They’re on my to-buy list! I hope you find them!!! This looks amazing!I have been hearing about the candy corn m&m’s!Thanks so much for sharing! Haha, these wouldn’t last that long here either! They look so moist and delicious, and that frosting is so insanely fluffy, I’m surprised it actually made it onto the cake bar (I probably would have caved and stuck my face inside the mixing bowl!) PS, candy corn M&M’s rock and I think they taste like it, too! I love it! I have been wanting to try the M&M’s Candy Corn. 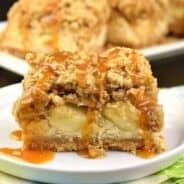 This is a recipe I have to make! Thank you! I LOVE those candy corn M&Ms. I made the mistake of buying a bag last year and putting them in my desk drawer at work…they were gone about two days later. Oops! I love how the colors pop against these cake bars–so festive! Hi Aimee. My name is Emily and I am an editor for AllFreeCasseroleRecipes.com. 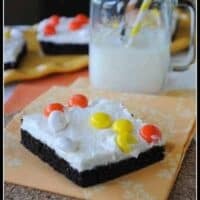 I recently wrote a blog post on RecipeLion.com about candy corn and featured your recipe. 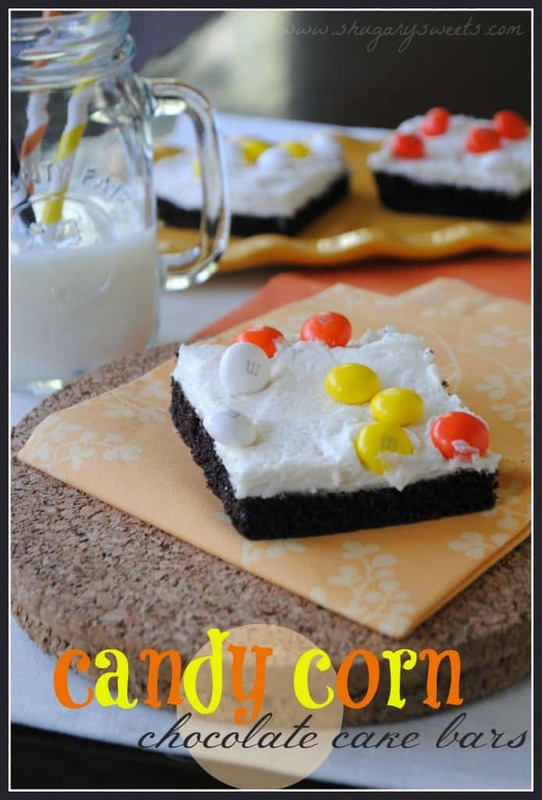 You can check it out here: http://blog.recipelion.com/must-make-candy-corn-recipes. These bars look so delicious! Oh yes, sometimes you just need something to hold the frosting besides a big spoon! I may have to go find those M&M or maybe I’ll just go through my secret (kids don’t know where it is) stash and see what I have on hand!